﻿ Where some bands have undeservedly found success, While She Sleeps have unfairly been left behind. And the worst part is that actuality was easy to predict after 2015’s sophomore effort Brainwashed, an album marred by delays thanks to frontman Loz Taylor’s throat surgery, and one that, for some reason, just didn’t seem to connect as well as their debut. And naturally this led to being left to the wayside by the same mainstream press who had branded them as the future of British metal upon This Is The Six‘s release (the perfect evidence for a pretty face and catchy chorus having more stock than a band with something to say). Yet they continued to soldier on, building their own studio and crowdfunding their third album in the most emphatic display of metal’s community aspect seen in some time. With that in mind, and taking into account You Are We as an album, it’s easy to paint a picture of the band that While She Sleeps are in 2017. If Brainwashed was the relative sophomore slump, You Are We regains their footing in spectacular fashion, a band fully galvanised to push themselves to their absolute limit with no compromise. This is across the board too, particularly in the vocals which see guitarist Mat Welsh playing a heavier role alongside Taylor’s lead. And while this could see some assuming that While She Sleeps are heading in the direction of the oft-maligned tag-team metalcore setup, there are two main points that blow this idea clean away. One: Welsh’s contributions are much more variegated and dynamic than a simple clean chorus, like the smooth, liquid refrain of Hurricane or the bounding half-raps of Steal The Sun, and two: there’s not a hint of polish or extraneous trickery in sight. There’s a rawness in Welsh’s vocals, and while they act as the melodic foil to Taylor’s even harsher screams, there’s an untampered human quality that allows them to seethe for some real impact. It’s a similar case with the instrumentation, which sees all manner of darker, more subtle tones added to the core sound for the most varied, layered While She Sleeps album to date. The blackened acoustic picking combined with what sounds like an accordion on the title track hits the sweet spot between phenomenally lush and foreboding, while the violent stabs of strings on Feel and the static-corrupted solo that closes In Another Now factor in some weirder, more abrasive sounds without feeling forced or unnatural. But of course, this is a While She Sleeps album, meaning that the nucleus of rafter-testing melody alongside a wreck-your-neck metal assault remains firmly intact. Just look at Revolt for the best example of that, the sort of whirlwind of storming, heavy riffs that While She Sleeps have made their calling card, with Taylor at his most ire-stricken. With a dexterous command of melody at their disposal alongside their profoundly gimmick-free modern metal, You Are We is supremely ear-catching, even amongst this band’s output. With the soaring, gang vocal-heavy Settle Down Society, and the super-melodic accents that punctuate Silence Speaks that sound utterly fantastic amidst what is already the best metal song of the year (calling it), so much of this album would be the perfect transition between There Is A Hell…– and Sempiternal-era Bring Me The Horizon – intensely visceral, yet with clearly defined expansive and experimental edges. Hell, when Oli Sykes actually shows up on Silence Speaks, it’s the most fired up he’s sounded in years. Though given the lyrical content of this album, that’s not a surprise. Once again, You Are We sees While She Sleeps rallying against the ills of modern life, all while living up to its title by showing solidarity with the everyman in the street who is most affected. Overall the broadsides they fire aren’t anything really new – rallying against the destructive nature of war and those who use it simply for profit (Hurricane and the title track respectively); the feeling of frustration and helplessness while society visibly crumbles (Civil Isolation); the empty promises of the corrupt, manipulative holders of power (Revolt) – but there’s something so much stronger and more forceful this time around. Whether it’s the increased breadth in sound taking effect in the best way, or in lines like “We’re building walls when it should’ve been bridges” that co-opt the exact political rhetoric that’s unfortunately been all too common as of late, but rarely have While She Sleeps seemed as feral and bloodthirsty as they do here. In terms of modern metal where the slick, sandblasted variants have thrived for too long, it puts them in a league of their own. Then again, the same can be said about You Are We as a whole. This is precisely how mainstream metal should be done in 2017 – heavy and willing to push boundaries with something to say and an enrapturing way of saying it. For all the setbacks that While She Sleeps have faced in the past, and for all the times they’ve been written off as a band past their prime, You Are We is a breathtaking example of a band who aren’t going down without a fight. With the way that rock and metal are currently shifting with more interesting, organic acts finally getting their due credit, While She Sleeps have been thrust front and centre to lead the charge. Honestly, it’s hard to think of anyone better. 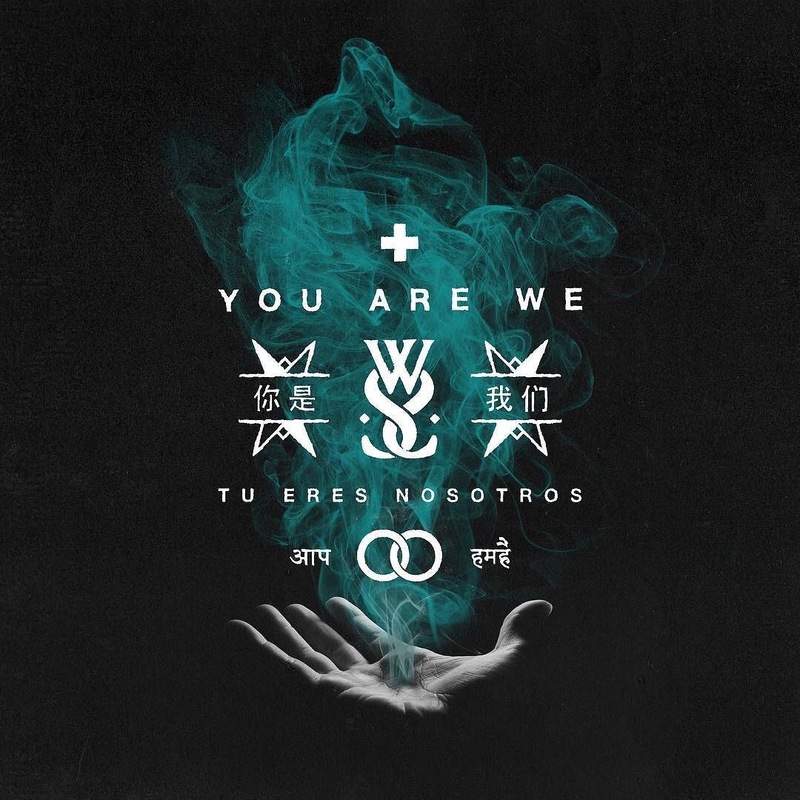 ‘You Are We’ by While She Sleeps is released on 21st April on Sleeps Brothers.